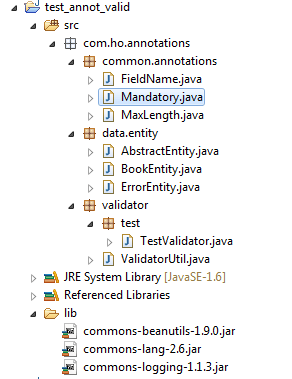 I would present you an example concerning the annotation in JAVA: validation POJO with annotation. Introduced with Java SE 5, the annotations are more increasingly used in the development of applications. Annotations provide informations about a class and they have no direct effect on the annotated code. Annotations can be preserved at runtime (RetentionPolicy.RUNTIME) or are only available at development time, during the compile (RetentionPolicy.SOURCE). There are standard annotations and Java allows the definition of custom annotations. This annotation added to a method, notifies the Java compiler to check if the annotated method really overrides a method of an interface or the extended class. This annotation added to a field, method or constructor, indicates that the annotated element should not be used anymore. It is possible to add this annotation to a class, however, this doesn’t deprecate automatically all its fields and methods. java.lang.annotation.ElementType enumeration which provides a simple classification of the declared elements in a Java program. ANNOTATION_TYPE – Annotation type declaration – used for other annotations. LOCAL_VARIABLE – Local variable declaration – It can’t be read at runtime, so it is used only for compile-time things, like the @SuppressWarnings annotation. what its retention policy is (aptly named @RetentionPolicy; some annotations are kept only at the source level, others at runtime). + RetentionPolicy.SOURCE: Discard during the compile. These annotations don't make any sense after the compile has completed, so they aren't written to the bytecode. + RetentionPolicy.CLASS: Discard during class load. Useful when doing bytecode-level post-processing. Somewhat surprisingly, this is the default. * Marks the field as Mandatory : a null value is illegal. * Specify the maximum length of the annotated field. * This class handles the validation of the entity. * Validates all the annotated field of the given entities. No error found in the validation of this entity!